Be sure to follow me on bloglovin' and never miss a delicious recipe. I am not even kidding when I say this cake is so DANG good! It could quite possibly be one of the lightest cakes I have ever eaten. If you served this cake to someone, they would have no clue it's a skinny cake. 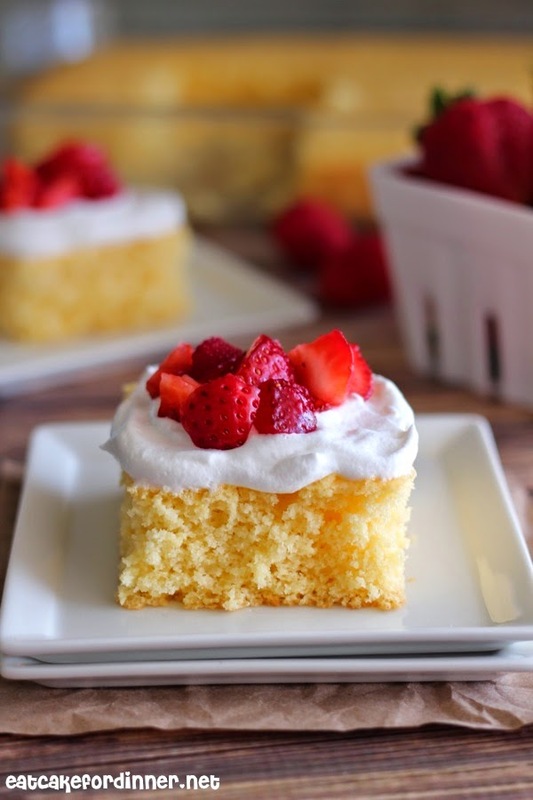 There are only FOUR total ingredients - A cake mix, a can of soda, light whipped topping and strawberries. That's it. The cake is made with a cake mix and a can of soda. No oil and no eggs, just soda. 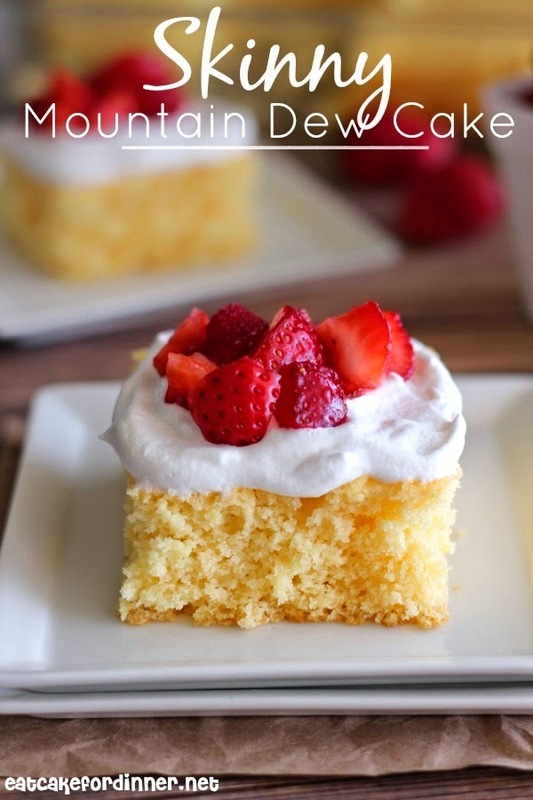 It creates the softest, lightest cake and I am blown away by the result. I love Diet Mountain Dew and that is what I used, but you can't actually taste the soda in the finished cake. If you are against diet sodas, regular works great too. Or if you don't drink caffeine, Sprite is another great option. Preheat oven to 350 degrees. Grease a 9x13-inch cake pan; set aside. In a large bowl, combine the cake mix and can of soda. The soda will foam up a bit. Whisk together until just combined. Do not overmix. Pour into cake pan and spread out evenly. Bake for 30 minutes or until top springs back when lightly touched and a toothpick inserted in the center comes out clean. Cool completely. 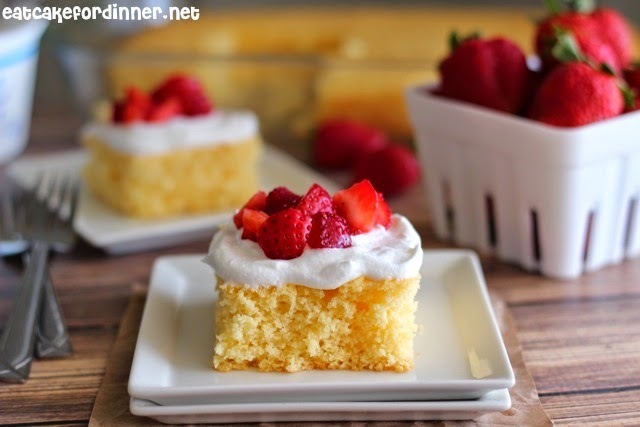 Serve with whipped topping and chopped strawberries. Jenn's Notes: The cake is so soft and it cuts cleanest when using a serrated knife. Regular soda can be substituted for diet or a different flavor can be substituted for Mountain Dew. 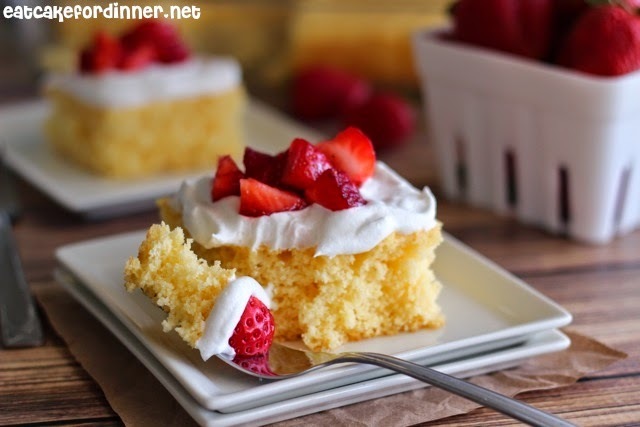 I have also tried this cake with vanilla frosting and the whipped topping is a much better option for this light cake. Such a cool idea, Jenn! Love how simple this is to make too. I keep seeing these cakes and it is so cool! Yours looks delicious and I definitely need to try this soon. I can't believe it took me so long to try it, because it is delicious. You need to try it out ASAP! I love recipes like this! And I'm currently sipping on a diet mountain dew so I think I'd dig the cake. Diet Mountain Dew is the best huh!! This looks awesome! I love the idea of lightening up a cake with soda, and never thought to use my favorite, Dt. Mountain Dew! :) This will definitely be a must try in the near future. It totally works! I hope you try it. Mmmmm....I wonder how cherry coke and chocolate cake might work?! Your photos are GORGEOUS!!! Love this cake! 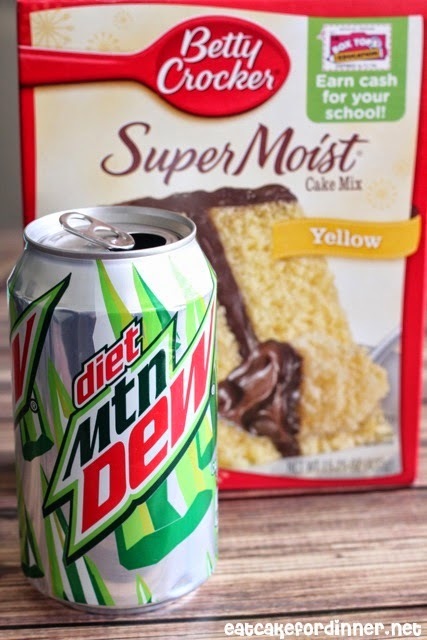 I've never made a soda can cake, but I bet it's super moist and delicious! Love this flavor combo!! I'm from North Carolina and grew up on Cheerwine. I now drink the diet version and still love it!! I bet that and chocolate cake would be good!! However, I'll keep the Diet Mountain Dew in mind. My brother-in-law loves that drink so I bet he would enjoy that cake best. Thank you for sharing this and I am Pinning it!! sounds great and I love Mt dew!! Getting ready to make this cake and was wondering if this would work well as a bundt cake! Can't see why it wouldn't but wanted to ask if you had ever made the cake this way! Going to use real Mt. Dew instead of the diet Mt. Dew. I do not like the bitter taste of any diet drink! :0) Can't wait to try this! I love, love, love your recipes!